Has the NH Commissioner Been Lying to Parents? Now that the abysmal Smarter Balanced scores have come out, the spinning has just begun. The Common Core soldiers in the state are spinning these results to avoid some of the tough questions that come from this testing scheme. In the past, New Hampshire under Commissioner Virginia Barry, students took the NECAP. Now they are taking the Smarter Balanced Assessment. Under the NECAP, New Hampshire students showed relatively high levels of proficiency in the core subjects. Those proficiency levels just DROPPED. What does this mean for children who took the NECAP and those who recently took the SBA? Does this mean, as one activist in New Hampshire recently said, the NH Department of Education has been lying to parents in the past? While they SPIN these results, it’s important to note how none of these bureaucrats take responsibility for any of this. This entry was posted in Smarter Balance, Testing and tagged CommissionerBarry, Lying, Results, SBA, SBAC on November 16, 2015 by SCC. Has anyone heard a peep from the New Hampshire Board of Education on this? Oh that’s right, the Smarter Balanced scores have been sent to the Superintendents with the direction NOT to share that information with school board members (the ones that hire and fire them) or the community until November 12th. Only Nashua and Alton’s Superintendent released the preliminary scores. 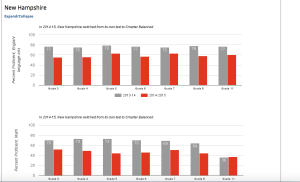 As we are looking at scores plummet due to the flawed assessments that show our schools are failing, Vermont’s Board of Education took a step to notify parents on how bad the Smarter Balanced Assessment is. According to the blog, “Wait What,” NEWS FLASH: Vermont State Board of Education Trashes Common Core SBAC Test. Does anyone think the New Hampshire Board of Education will be equally honest with parents? Our advice: DON’T HOLD YOUR BREATH!!! You have received, or will receive in the near future, a report of your child’s standardized “Smarter Balanced” test results from the Vermont Comprehensive Assessment Program. This report is provided in the national assessment consortium’s format. We are working on a friendlier and more appropriate presentation for next year. Tests are useful if used within the limits of their design, but they cannot provide you with a comprehensive picture by themselves. The State Board and Agency of Education support using a broad range of tools, measures and methods to help you and educators understand and improve your child’s learning. Essentially, these test scores best serve to show the progress that our schools are making, and to help teachers adapt their curriculum to fit the needs of their students. As a parent, encourage your child to reach as high as he or she can. Let her or him know that they are worthy and capable. Keep track of how well your child is doing over time and use that information to help your child grow as a learner. Meet with your child’s teachers so that they understand your child and so you can work as a team. We must give every student a thorough and comprehensive education, and provide the nurturing and support each child needs to grow into an effective, productive, and self-directed citizen. In turn, these young people must be the strong parents for the generations of Vermonters yet to come. This entry was posted in Smarter Balance, Testing and tagged SBAC, SmarterBalancedAssessment, Vermont on November 5, 2015 by SCC. The FRAUDULENT Smarter Balanced Proficiency Scores? The Smarter Balanced Assessment is the standardized assessment the New Hampshire Department of Ed chose to force upon the public and charter schools in New Hampshire. “My name is Doug McRae, a retired testing specialist from Monterey. The big question for Smarter Balanced test results is not the delay in release of the scores, or the relationships to old STAR data on the CDE website, but rather the quality of the Smarter Balanced scores now being provided to local districts and schools. These scores should be valid reliable and fair, as required by California statute as well as professional standards for large scale K-12 assessments. When I made a Public Records Request to the CDE last winter for documentation of validity reliability and fairness information for Smarter Balanced tests, either in CDE files or obtainable from the Smarter Balanced consortium, the reply letter in January said CDE had no such information in their files. I provided a copy of this interchange to the State Board at your January meeting. There has been no documentation for the validity, reliability, or fairness for Smarter Balanced tests released by Smarter Balanced, UCLA, or CDE since January, as far as I know. It’s important to note that the tests developed by AIR include a focus on controversial social issues instead of academics. We continue to support quality ACHIEVEMENT TESTS (versus assessments that focus on behaviors, attitudes, dispositions, etc.) If you want to know your child’s proficiency in the core academic subjects, have your children take an achievement test outside the school district. This entry was posted in Smarter Balance, Testing and tagged California, DougMcRae, SBAC, SmarterBalanced, testimony on October 28, 2015 by SCC. 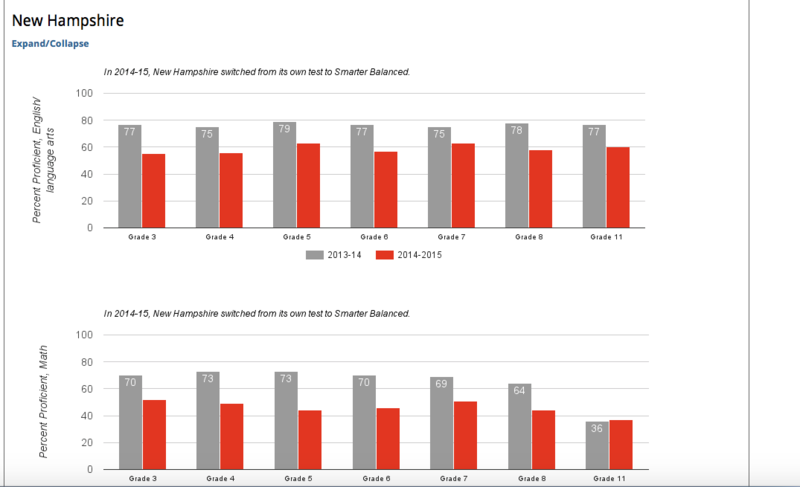 NASHUA Smarter Balanced Scores RELEASED: It’s Not Good? The New Hampshire Dept. of Education directed Superintendents across New Hampshire to withhold the data on the preliminary proficiency scores from the Smarter Balanced (Common Core) Assessment. Parents and school board members around the state began asking, who do the Superintendents work for? Commissioner Barry OR the local community that hires and fires them? Once again, we see the Commissioner directing our Superintendents as if they work for her. Commissioner Barry continues to pit NH Superintendents against the people who pay their salaries. The Nashua School Board recently directed their Superintendent, Mark Conrad, to release the preliminary scores. As we predicted, the low scores are shocking. We do want to remind everyone that these are PRELIMINARY SCORES and are subject to change, however these initial scores do not look good at all. This might be a startling revelation for many people, but can you rely on these scores to determine if your child or school is not performing well? We’ve posted information on how the Smarter Balanced Assessment is FUNDAMENTALLY FLAWED. We’ve shared information from assessment experts who’ve reminded us that this assessment has NOT been independently validated. We know the Nashau teachers have informed the community that this assessment comes with serious problems. So why does Governor Hassan, Commissioner Barry and the NH Department of Education, continue to force this upon our schools and students? When will they choose an achievement TEST that is validated and tests knowledge? Why do they continue to force our schools to use psychometric assessments that assess our child’s values, attitudes and beliefs? The New Hampshire Department of Education operates with a standardized assessment that no one can rely upon for good data and yet this is the information that will be collected on your children and used against them and your teachers too. This was a SET UP FOR FAILURE for your children and teachers! INCOMPETENT? That’s what we are beginning to believe. This entry was posted in Miscellaneous, Smarter Balance, Teachers, Testing and tagged Nashua, Results, SBAC on October 22, 2015 by SCC. We have many parents and teachers who contribute to our blog and we want to thank them for helping other people to understand the numerous problems surrounding Common Core. Most of the time we refrain from sharing the identity of our contributors because teachers for instance, can face bullying from administrators if they speak publicly against this reform effort and expose what is going on in the classroom. Just when you thought things were bad enough, it gets worse. We have entered the Orwellian Era when school board members no longer use the plain and primary, or tertiary for that matter, definitions of words in an effort to make any word or phrase have the meaning they desire in place of the plain meaning and intention of the original author. Lest we be convinced, the original author of 2015 School Warrant Article 6 went on the written record time and again to state the intent and purpose of the article in question. Therefore the obfuscation by the school board members is intentional. But wait, it gets worse. They told us that the Smarter Balance Assessment© (SBA) would provide us more timely results that teachers could access to customize student education plans. Well here it is late October and we are still waiting for the results! Then there is the actual scoring. The SBA is designed to allow comparison across schools, districts, and states as to the efficacy of their educational system. Almost like the SAT’s, GRE’s, etc. The striking difference is that different states have different ‘cut scores’. That is to say, different states have been given different thresholds as to what is acceptable and what needs improvement. That means that the state to state comparisons we were promised will not be possible. What is the criteria for setting the ‘cut scores’ you ask? That is a very good question. Let me know if you can get a straight answer, or any answer, to that question. But wait, it gets worse. The results have been known for quite some time, yet the NH Department of Education refuses to release the scores. Further, the NH Department of Education has instructed Superintendents to tell school boards and citizens that the reason for the non-release is because they are still scoring the paper and pencil version of the test. The online version of the test is adaptive. That is to say if you answer correctly you move on to more difficult questions. If you answer in error then you continue to receive questions of a similar difficulty. This is not possible on a paper and pencil test. This means that the results of the online and paper and pencil versions should be neither combined nor compared. So why the delay? That is a very good question. Good luck getting an answer that is not evasive. But wait, it gets worse. The administration, to include the DCS principle and SAU53 superintendent say that the school district will respect a parent’s right to refuse their children(s) participation in the SBA. One school board member is on record saying that parents do not have such a right. Likely there are other members of the board that agree with the aforementioned member but they are unwilling to comment publicly on any matter of importance for reasons known only to themselves. There is no clear policy on the matter and the board refuses to even discuss the matter despite repeated requests for clarification on this point. So the elected body that is responsible for setting policy refuses to perform their duties. This leaves parents in limbo and creates needless confusion. This situation could lead to needless, time consuming, and costly legal action against the district should the wrong tack be taken. But wait, it gets worse. Imagine an elected body that refuses to perform is primary duties in earnest but will while away their time on perfunctory matters. At least we have very clear definition as to the priority user list for the school gymnasium and the fees for such use! Imagine an elected body that ignores the will of the people as expressed at the ballot box that they were elected to represent. One has to wonder why we should trust our elected officials when they are so feckless and unresponsive. This entry was posted in Smarter Balance, Testing and tagged Deerfield, KevinVerville, Results, SBAC on October 22, 2015 by SCC.